Triple H Announces New "Can't Miss" WWE Studio Show For FS1 To Premiere Later This Year - Wrestling Inc. 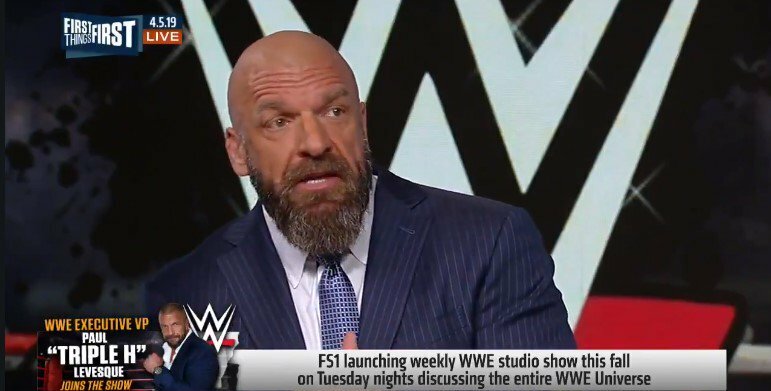 Triple H appeared on Fox Sports this morning to announce that WWE will premiere a new studio show on FS1 this fall. The discussion show will air on Tuesday nights. It was noted that more details on the studio show will be announced soon, including the premiere date and the weekly timeslot. It was noted that there will be familiar faces on the show, from the past and present. WWE SmackDown will jump to Fox beginning Friday, October 4. It's been rumored that more WWE programming could be included in the new deal with Fox and WWE has wanted to do a studio show for some time now. Triple H said this studio show is something he's wanted to do for a long time. "This is something I've wanted to happen for a long time," Triple H revealed. "I think this is the perfect opportunity for it. A studio show, for us, it kind of, because of the sports entertainment aspect of it, it's an endless show where you're talking about the athletic component of it, it's also an entertainment... where you're talking about where things are going, the storylines and the characters all of it. This is going to be one of those shows, that if you're a WWE fan, across the board, this is the show that will be 'can't miss' because it's going to talk about everything you love, in a way you can't get anywhere else." Triple H continued, "To take people deeper into the personal lives and the day-to-days of what goes on behind-the-scenes to being a WWE Superstar, and anything that goes with it. That success, that failure, that heartbreak, that sorrow, that elation of WrestleMania moments, all of it. To see that all take place here, but in a way that's never been shown before. I can't wait for this."